The name ‘al-Jazair’ (the islands), which has long been used to denote the capital, Algiers, is derived from the rocks in the sea nearby. 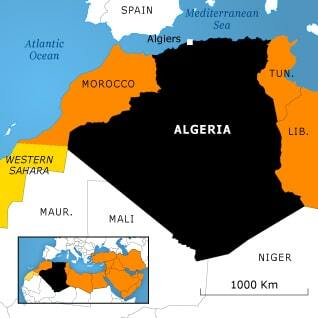 Algeria, a large country rich in natural resources, can be considered the quiet giant of North Africa. Although part of the Arab world, a sizable minority of the population identifies itself as Berbers, and there is still a considerable French cultural influence. Throughout history, Algeria has experienced major social, economic and political shocks. Half a century ago, independence from France was gained only after an atrocious war against the colonial power. After a promising start as a major oil producer during the oil boom, a fundamental political and economic crisis in the 1980s culminated in a decade of civil war between Islamist groups and the armed forces. At the turn of the millennium, decreasing violence and higher oil prices led to greater stability, especially compared to other countries in the Middle Eastern and North African region, but the structural tensions in politics and society have not been resolved. The military is still the major political power, and the country is still economically very dependent on revenue from international oil and gas sales. The Arab revolutions that emerged in neighbouring Tunisia, Libya, and elsewhere in the region beginning in 2011 appeared to have left Algeria unaffected. The impact of these events is as yet uncertain, and the regional upheavals in the Maghreb and Sahel, coupled with an imminent political-succession question, may have consequences in the years to come.